« Could Ablation for AF Be an Elaborate Placebo? Where does Bronchial veins drain ? One casual question in my class led to this search for an anatomical mystery. When we were discussing why left atrial oxygen saturation never reaches 100 % ? , it was attributed to desaturated bronchial venous blood draining into pulmonary vein. How does this bronchial vein enter pulmonary venous circulation ? How many bronchial veins are there ? What anatomical plane it runs ? Surprisingly, even in this hi-tech era of academic excess, literature is sparse for this basic anatomical question. It is reported (In Greys anatomy ? ) 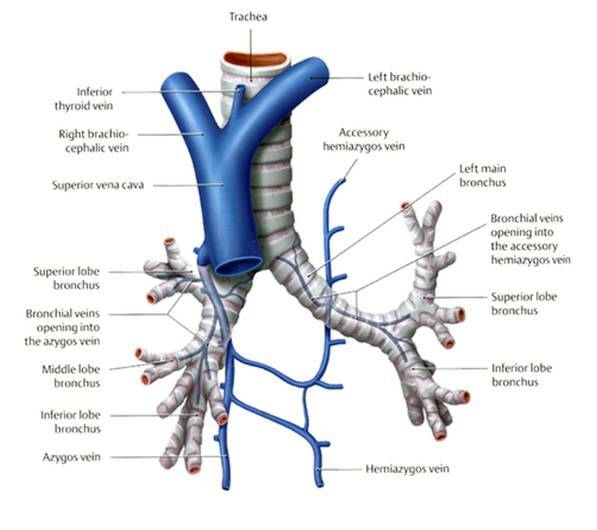 Bronchial veins are two in number and both drain to Azygos and Hemiazygos veins (systemic) rather than pulmonary veins. So is our assumption wrong ? May not be.We realise these are only two visible and named bronchial veins .It is learnt they probably carry only about 13 % of bronchial venous blood to systemic venous circuit. Image showing right and left bronchial veins draining to Azygos and hemiazygos veins. True physiological bronchial venous drainage seems to be different from anatomical bronchial venous circuits . 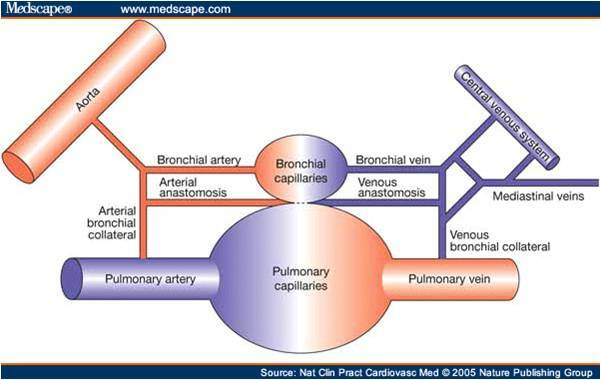 Clinical implication of bronchial venous circulation. In physiology it may not be important . However bronchial circulation (both arterial and venous) can take many anatomical tracts when pulmonary micro vascular bed is structurally and functionally altered as in COPD, , pulmonary atresia with aorto-pulmonary collaterals , congenital left to right shunts,post Fontan circulation pulmonary AV malformations,lung tumors etc . Hemoptysis in acute pulmonary venous hypertension is thought to be due to rupture of these bronchial veins as elevated pulmonary venous pressure reflect into bronchial veins (As in mitral stenois and other conditions. ) This again would vouch for bronchial veins draining to pulmonary veins. As on today , it can be concluded bronchial vein drainage goes both systemic and pulmonary venous circuit.Bulk of them appear to end in pulmonary veins though clear anatomical evidence is lacking. Exploring human anatomy appear a grossly unfinished agenda even today, especially the micro and histo-anatomy. Teachers of basic sciences should impress upon youngsters entering the medical school to pursue translational research relevant to specific clinical problems. Students may contact <drsvenkatesans@yahoo.co.in> for specific areas of clinical cardiac anatomy topics that still requires answers. 2.Baile EM The anatomy and physiology of the bronchial circulation.J Aerosol Med. 1996 Spring;9(1):1-6. DearDoctor, where indeed do these bronchial veins drain? It is important during cardiopulmonary bypass surgery to understand and appreciate bronchial flow. Since some bronchial flow does , indeed, return to the Left side of the heart, the left ventricle can distend during bypass with this volume. Bronchial flow to the left side of the heart can also warm the heart when we take great measures to preserve the myocardium at 15 *C. Only in certain cases do surgeons use a left heart vent to suction volume from the left heart. Since the left ventricle is poorly seen by direct vision by the surgeon, the left ventricle can get very full before it distends. Left ventricle distention is bad on bypass. I enjoyed your article and I hope my comment gives you another aspect to add to your discussions. Thanks Dr Donna Lackner , It definitely adds another dimension to the importance of this mystery circulation.Will encourage my surgical colleagues to do look into this.